Surrey highways teams overhauling a road as part of Operation Horizon. Click to download. A drive to make more Surrey roads pothole-proof has saved taxpayers £4m in one year – but the county council has warned Surrey still faces a highways funding gap of around £60m from Whitehall. 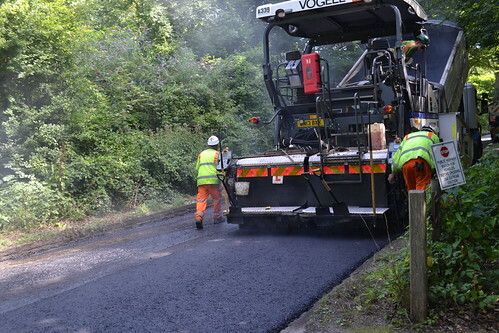 One year into its push to upgrade 300 miles of road with 10-year repair guarantees, the council has saved £4.4m through smarter contracts and recycling. Although the saving could overhaul 16 miles of road for free – half the width of Surrey – Department for Transport funding for the county is still £60m short of the £132m needed to maintain Surrey roads for the next five years. Last winter’s flooding left the council with a £23m additional roads bill but mandarins have only provided the authority with £9.2m to cover this. These £23m repairs included a two-month blitz on around 17,000 potholes and starting major work on over 30 damaged bridges.